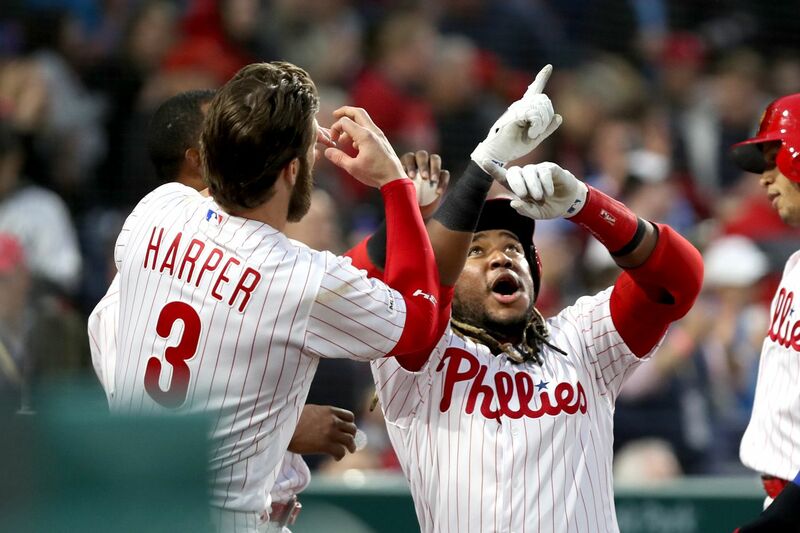 Maikel Franco, right, and Bryce Harper celebrating after Franco's three-run homer against the Mets, part of a 10-run first inning. Breaking news: The Phillies’ first inning has finally ended. You know it’s a good night at the ballpark when the first item in the team’s postgame notes starts with the words “the Phillies’ 10 runs in the first inning.” That item went on to explain that it was the most runs since the team had scored 12 in the first inning on April 8, 2017, against Washington. It was also only the eighth time in franchise history that the Phillies had scored double-digit runs in the first inning. The best item was the second one on the list. For the first time since 1883, the year that 60 feet, 6 inches was established as baseball’s official mound distance, the Phillies scored eight runs against an opposing starting pitcher (Steven Matz) and knocked him out of the game after eight batters. According to Elias, it was the first time any team in baseball had done that since the Los Angeles Dodgers against Cincinnati’s Paul Wilson in May 2005. The 14-3 rout allowed the Phillies to jump back in front of the New York Mets at the top of the National League East. To stay there, however, they will need to win today’s 1:05 p.m. game in the series finale at Citizens Bank Park. Jerad Eickhoff of the Phillies pitches against the Mets at Citizens Bank Park on April 16, 2019. Good morning, Phillies, and congratulations on your rout of the Mets last night at Citizens Bank Park. Amazingly, the highly successful evening also had its share of bad news and created some problems (or at least a few conundrums) for manager Gabe Kapler. The bad news came on the injury front with first baseman Rhys Hoskins sitting out because of a mild ankle sprain. He thinks he will be back for today’s 1:05 p.m. series finale against the Mets. Regardless, the Phillies will likely be without starting shortstop Jean Segura, who left the rout with a tight left hamstring. Even though it ended up being a lopsided victory for the Phillies, the top problem going forward remains Nick Pivetta. Despite being spotted a 10-run lead after one inning, the Phillies’ struggling righthander still had another unimpressive outing. He covered only five innings, allowed three runs on seven hits and three walks, and struck out just two. That pedestrian performance did allow him to lower his ERA from 9.45 to 8.35, but it also opened the door for some conversation about whether he should remain in the starting rotation. Actually, it was Jerad Eickhoff who opened that door. The best pitcher on the Phillies staff three seasons ago appears to be regaining that form and was impressive in his four shutout innings of relief behind Pivetta. His curveball was particularly impressive as he picked up the first save of his career by allowing just three hits and striking out six. The Phillies also got two impressive innings from Drew Anderson on Monday night before sending him back to triple-A Lehigh Valley. If nothing else, it has to be clear to Pivetta that the Phillies have some viable rotation options. Enyel De Los Santos, who is 2-0 with a 0.75 ERA for the IronPigs, is also on the potential recall list. The most pleasant problem Kapler has right now is what to do with a white-hot Scott Kingery, who was a triple short of hitting for the cycle last night. After a difficult rookie season, Kingery is off to a sensational start in his sophomore season. There’s no better friend of a baseball beat writer than a first-inning blowout during a night game because it relieves all deadline pressure. So our Matt Breen owes a big thank you to the trio of J.T. Realmuto, Scott Kingery and Maikel Franco for making last night a relatively easy one. Realmuto triggered the 10-run first inning with a two-run double and added another two-run double later in the inning. He also homered later in the game and finished with five RBIs. Kingery’s three-hit day included a three-run homer in the first, and Franco’s team-leading sixth homer was a three-run shot to center field in the first. "That was probably the craziest first inning I had ever been a part of,” Realmuto said. Kudos to commissioner Rob Manfred for making it clear that Phillies chairman David Montgomery is the reason the 2026 All-Star Game will be taking place at Citizens Bank Park. Montgomery, who has shown his legendary class and feistiness while battling cancer, was not at the Independence Hall ceremony announcing the event Tuesday, but it was a stroke of brilliance to make sure the midsummer classic was in our city during the same summer our nation will celebrate its 250th birthday. Photographer Charles Fox handled the night in photos, and my personal favorite is the “hairy” shot of offensive star Scott Kingery in the dugout. Scott Kingery, center, of the Phillies is congratulated in the dugout after hitting a 3-run home run off of Steven Matz of the Mets in the 1st inning at Citizens Bank Park on April 16, 2019. Manager Gabe Kapler updated Segura’s injury status after Tuesday night’s game and described it as a mild strain of the left hamstring. If you can get money down in Las Vegas on Wednesday’s lineup, bet your house that Kingery will be at shortstop. Breen’s notebook not only points out that first baseman Hoskins was out of the lineup last night because of his mild ankle sprain, it also provides the bad news that ace Aaron Nola’s 7.45 ERA through four starts is the worst among the 47 pitchers who have logged at least 19 innings so far this season. Kapler said Nola is looking into making some minor mechanical adjustments. Today: Jake Arrieta closes out series vs. Mets against Zack Wheeler, 1:05 p.m. Tomorrow: Zach Eflin opens series in Colorado vs. Kyle Freeland, 8:40 p.m.
Friday: Vince Velasquez vs. Rockies ace German Marquez, 8:40 p.m.
Saturday: Aaron Nola vs. Antonio Senzatela, 8:10 p.m.
Sunday: Final game of the series with Rockies at Coors Field, 1:10 p.m.
Maikel Franco crosses home plate after his three-run home run during the Phillies' 10-run first inning against the Mets. A year ago, only eight players in baseball hit more than six home runs during the entire season while hitting out of the eight hole. One of them was former Phillies catcher Jorge Alfaro, who had nine. Yasiel Puig had 10 home runs in 33 games as an eight-hole hitter with the Dodgers last season, and Dansby Swanson had 10 in 87 games with Atlanta. This comes up now because Franco hit his sixth home run in just 15 games out of the eight hole last night against the Mets. The most home runs by a National League No. 8 hitter in this century is 18 by Washington’s Danny Espinosa in 2016. Question: I would like to know why when the Phillies put Pat Neshek on the mound and he does well why he does not get sent out in the next inning and let him go until he runs into trouble? Other pitchers get used for more then one inning except Neshek. Answer: Thanks for the question, Dorothea, and for reading Extra Innings. Neshek has had a terrific career, and he has been especially good in the parts of three seasons he has pitched for the Phillies, posting a 1.62 ERA in 81 appearances. What he is not conditioned to do any more is pitch more than one inning, and that has been the case for quite a few years. Since 2015, Neshek has pitched in 235 games, has logged 196 innings, and has 183 strikeouts with just 35 walks. His WHIP — walks and hits per innings pitched — is a remarkable 0.995 in that span. What he has done just six times during that period is pitch more than a single inning. He did not do it all last season, and it’s unlikely he will do it this season.